RadioUser February 2019 now on sale! What is inside this month's issue? 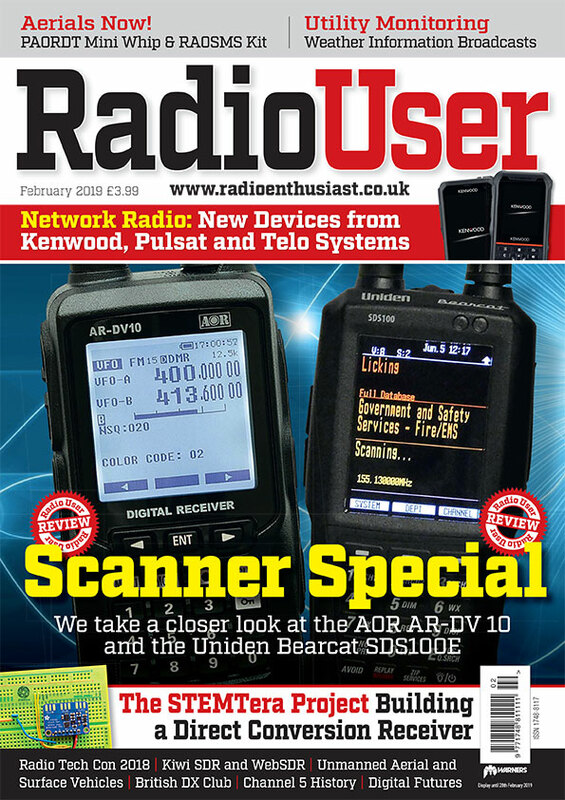 The new February issue of RadioUser is available to buy now! So what is inside this month's issue? SenHaix SPTT-N60, Tecsun PL-360, a bhi groundbreaker, Sirio airband aerial, AOR AR-DV1 Tetra Decoding and more innovative products; radio for refugees, for mental health and for much more. Our bookstore enables you to order the books reviewed in the magazine and many new radio titles. Keith Hamer and Garry Smith conclude their two-part mini-series on the 20-year history of Channel Five. In this second part, they look at Channel Five transmitter tests and launch timetables. Liam Hargreaves gets hold of the latest model AOR AR-DV10 handheld digital receiver and offers a review of the radio, using the most recent firmware V 1807A/1810A and SN AA630226. At a time of drone-disruptions at Gatwick, David Smith has news on unmanned aerial vehicles, channel spacing and capacity, before delineating comms at Belfast Aldergrove Airport. Robert Connolly traces unmanned surface vessels provides an in-depth introduction to AIS technology and remembers the tricky South Pacific rescue of yachtswoman Susie Goodall. Chrissy Brand reports from Radio Tech Con 2018, emphasises diversity in radio and discusses loudness standards and immersive audio podcasts. Roger Thomas introduces his STEMTera breadboard radio direct conversion receiver building project, looking at its parts, functions and uses. Kevin Ryan undertakes an excursion into digital radio futurology, outlining forthcoming scenarios for the evolution of DAB and DRM services, and of new equipment, throughout 2019. In our second extended scanner review in this issue, Tim Kirby puts the new Uniden SDS-100E wideband receiver through its paces, evaluating its performance across the board. Oscar the Engineer assesses professionalism and informality in free radio and speculates on how studio equipment can influence presentation and quality standards. In his bi-monthly column, Simon Parker has news on the Midland Dual Mike microphone and on a PMR446 event, and he weighs the likelihood of new transceiver models appearing in 2019. Chrissy Brand offers Turkish delights, surfs transatlantic medium wave, appreciates online music from the Balkans and presents radio loggings from around the globe. Keith Rawlings offers a critical appraisal of active aerials, in terms of their design and function and reviews the performance of the PA0RDT mini whip and the RA0SMS mini whip kit. Nils Schiffhauer advises on how you can easily receive and monitor a plethora of weather-related maritime utility signals on MF and HF, and he offers a comprehensive list of relevant frequencies. Chris Rolinson surveys some significant forthcoming radio conferences; he has news on the latest crop of network radios and bemoans the ghostly remains of some much-valued equipment. Andrew Barron introduces the SDR.hu webSDR Receivers website and has fun working with the WebSDR network and KiwiSDR board open-source receiver. David Harris shares his opinions of a new book on the relationship between radio, international relations and the nation state. Scott Caldwell offers his 2018 Annual Review of the membership profile, publications, activities and aspirations of this key UK DXing organisation. Radio rallies, up-to-date contact details and related opportunities, for the first quarter of 2019.